Explore Cody and the area from the seat of a bike! Trail maps will guide you through spectacular country while the street maps will take you past historic buildings and the downtown area. 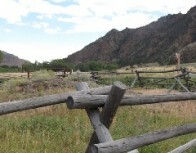 Click the images below for biking trails around Cody. Absaroka Bikefitters and Backcountry Guides offer single day trips to multi-day backpacking adventures. 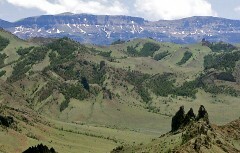 Their knowledgeable guides will help you decide what trip best suits you to get out explore northwest Wyoming. See secluded lakes, high alpine tundra, elk, deer, wolves or grizzly bears. Call them to book your adventure in the rugged backcountry of the West. Call for hours and pricing. 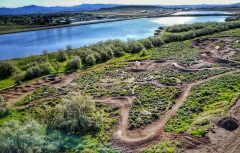 Ten miles of pupose built trails, jump lines from beginner to advanced, a pump track, a drop zone and skill trails. Open during dry conditions. The Shoshone National Forest was set aside in 1891 as part of the Yellowstone Timberland Reserve, making the Shoshone the first national forest in the United States. It consists of some 2.4 million acres of varied terrain ranging from sagebrush flats to rugged mountains. The higher mountains are snow-clad most of the year. Immense areas of exposed rock are interspersed with meadows and forests. With Yellowstone National Park on its western border, the Shoshone encompasses the area from the Montana state line south to Lander, Wyoming, and includes portions of the Absaroka, Wind River, and Beartooth Mountains.